RAIDERS head coach Kieron Dawson is targeting a strong finish to the season after a third victory in four games on Saturday. 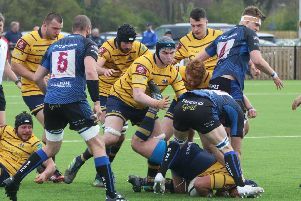 Dawson was pleased with his side’s win over Bury St Edmunds and said: “At 13-3 down at half-time, we’d have been happy with the win but we’re disappointed not to get the bonus point. We left so many chances out there but I thought we played really well. “At our de-brief, we said that we made so many chances but didn’t take them, so that’s something we’ll be working on. “We’ll just look to finish strongly now, get all the lads sorted out and tied down for next year and get a few additions in. “We brought a lot of lads in from outside and it hasn’t worked out this season, so we’ll look around locally to see what’s around. Dawson admitted it was a big boost to have both Kiba Richards and Alex Nielsen back in the starting line-up and said: “Having Kiba and Alex is huge psychologically and in training. They’re still both a little rusty, they’re not back to their best yet, so we’ll just keep working with them. “We’ll go up to Cambridge confident. Our scrum is going great, the line-outs are good, we’ve got plenty of attacking options in the back row, so there’s no reason why we can’t go up there and turn them over.